Linen Street car park could be pulled down within three years after councillors deemed the ageing site too costly to keep running. The car park has been described as nearing the end of its life with a potential cost of £439,000 in repairs just to stay open for three more years. But closing the ageing site down without a replacement will see a “significant” loss in revenue of around £136,000 every year and put pressure on other town car parks. 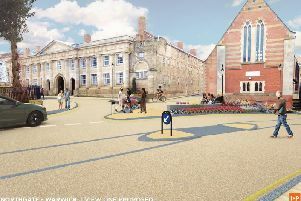 On Wednesday, Warwick District Council agreed a spend of £20,000 to look into other options for parking in Warwick town centre to replace the dilapidated site. The council’s executive was told the car park is “nearing the end of its life” and needs continued monitoring to mitigate ongoing structural issues. But members urged that a study is started with urgency. Cllr Moira-Ann Grainger (Con, Warwick) said while she welcomed the report, it was vital that the town council and residents are involved in decisions on the future of the site. She said: “This is the worst designed car park, cars do not fit in it and sections are already closed off for safety. An officer’s report read: “The survey of Linen Street indicates that it has reached the end of its design life. “The car park requires substantial concrete repairs and has steel bar degradation throughout. Estimated cost for immediate repairs is £439,000 which would only give an extra three years of life. Depending on what the reports show, full closure of the parking facility could be made the following year. The car park is still in public use but decks 8 and 9 are no longer safe for drivers. It also provides 30 residential parking spaces for homes in Martinique Square. Councillors have already set a district-wide parking tariff increase to raise £100,000 a year for repairs at sites including Linen Street multi-storey.